The sermon yesterday dealt with creating a life of confession and repentance in our prayers. 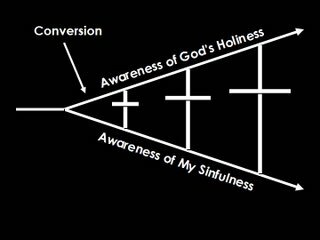 During the sermon I mentioned and displayed the Cross Chart created by Bob Thune from Corem Deo Church in Omaha. This chart is a terrific image of how true growth in our faith happens. The basic idea here is that as we grow as followers of Jesus we will become increasingly aware of two realities. The first is our awareness of God’s holiness, an increasing understanding that God is completely righteous, loving, just, and pure. He is sinless and morally perfect, and requires the same of His creatures. The second is an awareness of my own sinfulness, the reality that down to the core of my being I live for me and fail to honor God with life. A person is converted to Jesus when they become aware that they as sinners have no hope outside of Christ, but they repent and place their trust in Jesus for salvation and deliverance. You realize that the way this was obtained was through the cross of Jesus. But our understanding and trust in the cross does not end there, it begins there. The rest of life involves application of the Gospel, which is the tension created by these two realities. The crazy thing is that as a person grows, their life will become more holy and like God, but their sensitivity to their sinfulness will also grow. In the heart of a Christ-follower the gap between God’s holiness and our sinfulness will increase, even though the life of the believer will be transformed in visible ways. But as the gap grows in our thinking, the cross and importance of the Gospel keeps growing. Therefore, our appreciation of and hope in the cross will increase. Confession and repentance is the avenue to growth, then. As we continue to include confession in our prayer life we live in this tension. We see our own sin, and find ourselves to be honest with God, running to Him with our brokenness. We also see the Glory of God more and more as it is displayed in His holiness. But in the middle the cross of Christ stands, more and more beautiful, greater and greater still. And in this we realize that God has bridged the gap. Our only hope for dealing with sin is God’s grace demonstrated in Jesus’ substitutionary death in our place for our sin. This increasing awareness is what confession in our prayer life produces. So may we grow in this discipline, humbly coming to God with our sin.